The number of bike-share bikes in Seattle will double this week. Soon after that it will double again. And within a couple of months there will be even more shareable bikes lining the city’s sidewalks. Those bikes you’ve been seeing around town — the orange ones and the bright green ones dotting downtown sidewalks — are multiplying. On Monday, under regulations written by Seattle, bike-share companies were allowed to double the number of bikes they put on city streets, from 500 per company to 1,000. And they soon may be joined by more shareable bikes — silver ones and yellow ones. Two new bike-share companies have applied for permits to open in Seattle and could have bikes on the street as soon as next week. Last week there were 1,000 shareable bikes on Seattle’s streets, split between two companies, Spin (orange bikes) and LimeBike (green). By next week there could be 4,000 such bikes scattered across the city as two new companies, VBikes (silver bikes) and Ofo (yellow) have applied and are waiting for permits to open up business here. Based in Beijing and mostly operating in China, Ofo is one of the giants of the bike- share world and recently got $700 million in new funding. VBikes is based in Dallas, where it now operates, while it looks at possible future locations. 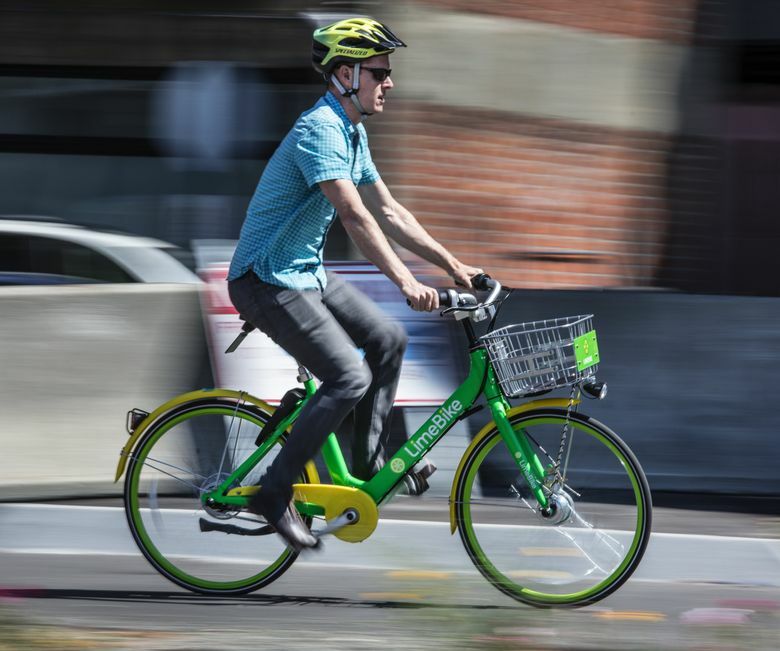 “Other cities are trying to follow Seattle’s example and get their permits and regulations up to speed,” said Luke Pettyjohn, general counsel for VBikes. One of the largest American cities without a standard, city-run bike share, Seattle has essentially become a testing ground for this new breed of stationless bike shares. The city’s regulations, part of a pilot program, allow the companies to expand again on Sept. 7, to 2,000 bikes each, and again on Oct. 7, when the limit on the number of bikes will essentially disappear. Companies pay the city a $15-per-bike fee as well as other administrative fees. The city will evaluate the pilot program at the end of the year before deciding whether to continue allowing the bike shares. The bike shares — all privately owned companies getting no government funding — work similarly. There are no stations to pick up or return bikes. Instead, you download an app, which comes with a map of nearby bikes. You use the app to unlock the bike (there’s a lock through the back wheel) and then leave the bike at your destination (don’t block the street or the sidewalk or leave it somewhere inappropriate). It costs $1 per 30 minutes. Spin and LimeBike have been operating, with 500 bikes each, for nearly a month. Both companies are a little cagey with their ridership statistics, although they will have to share them with the city, as part of their permit agreements. Spin announced that it had just over 5,000 rides in its first week of operation. LimeBike, which launched about 10 days later, announced about 10,000 rides in its first week. Pronto, the city-owned bike share that closed in March, had just 4,600 rides in its best week ever. Dan Stone, LimeBike’s Seattle general manager, said they had four vans distributing bikes around the city Monday — focusing on Ballard, Greenlake and Wallingford — and would have the full 1,000 bikes on the streets by day’s end. Derrick Ko, CEO and co-founder of Spin, said they’ll work their way up to 1,000 bikes throughout the course of the week.